Transudative pericardial effusion occurs in a situation of heart failure, valvular heart disease, myocardial infarction, primary hypothyroidism, nephrotic syndrome, liver failure, malnutrition, and other states associated with chronic salt and water retention (e. g., pregnancy). Anemia as a cause of pericardial effusion has not been described until date. A 20-year-old female came to the hospital with progressively increasing shortness of breath of 1 month duration. At the time of admission, she was breathless with routine daily activity. On examination, the patient had pallor, raised jugular venous pressure (JVP) and pitting pedal edema. Her blood pressure was 110/70 mm of Hg, pulse 110 beat/min. The apex beat was not palpable, and the heart sounds were faint, there was no friction rub or murmur. Spleen was palpable 2 cm below the costal margin there was no lymphadenopathy. The patient did not give any history of menorrhagia or blood loss from any other site. There was no history of fever, weight gain or loss and rash. Her hemoglobin was 1.7 g%, total leukocyte count 3530/cumm with differential counts of N-74%, L-20%, M-3%, E-1% and platelet count 6.10 lacs/cumm. Peripheral blood film examination showed microcytic hypochromic anemia with anisocytosis and few oval macrocytes. Reticulocyte count was 0.3%, mean corpuscular volume 79.8 fl, mean corpuscular hemoglobin concentration 21.5 g/dl, blood urea 36 mg/dl, serum creatinine 0.93 mg/dl, aspartate aminotransferase 30 IU/L, alanine transaminase 42 IU/L, serum bilirubin 0.8 mg/dl with direct-0.4 mg/dl, prothrombin time 14.1 (13.8 as control), INR-1.21, serum lactate dehydrogenase (LDH) 473 IU/L, serum total protein 5.9 g/dl, serum albumin 3.17 g/dl, serum globulin 2.73, A/G ratio 1.16, serum iron 48 μg% (70-150 μg%), serum total iron binding capacity (TIBC) 459 μg% (280-380 μg), % saturation 10.46%, serum ferritin 5 ng/dl (13-150 ng/dl), serum vit-B 12 300 pg/ml (200-900 pg/ml), serum folic acid 8 nmol/L (4.5-45.3 nmol/L), serum T3-1.36 ngm/dl (0.6-1.80 ng/ml), serum T4-9.6 mcg/dl (4.5-10.9 mcg/dl), and serum thyroid-stimulating hormone 1.14 μU/ml (0.85-5.55 μU/ml). Patient tested negative for antinuclear antibody panel, double stranded DNA, hepatitis B surface antigen, HIV and hepatitis C virus. Urine analysis was normal; stool for occult blood was negative, and there was no ovum or cyst. Gastroscopy was normal. Ultrasonography abdomen showed moderate splenomegaly. Chest X-ray showed moderate cardiomegaly; two-dimensional echocardiography showed normal chambers and left ventricular function, with normal valve morphology. There was echo free space 12 mm anteriorly, 20 mm posteriorly, 22 mm laterally, 10 mm apically, suggestive of moderate pericardial effusion. The pericardial thickness was normal [Figure 1]. A diagnosis of pericardial effusion with severe iron deficiency anemia was made. Fifty milliliter of pericardial fluid was drained. Fluid analysis showed protein level 1.1 g/dl, sugar 76 mg/dl, total cells were 5/cumm, all lymphocytes, and adenosine deaminase (ADA) value was <10 U/L. Tuberculosis polymerase chain reaction (TB PCR) was negative. Bacterial culture was negative. A 58-year-old female presented with progressive shortness of breath of 2 months duration. On admission, she was breathless even on daily routine activity. She had pallor and raised JVP. Her blood pressure was 130/60 mm Hg, and pulse rate was 120 beat/min. There was no hepatosplenomegaly or lymphadenopathy. Heart sounds were not audible. Her hemoglobin 2.4 g/dl, platelet 4.7 lac/cumm, serum iron 36 μg%, serum TIBC 480 μg%, % saturation 9.2%, serum ferritin 7 ng/dl, serum vitamin B 12 460 pg/ml, serum folic acid 6 mcg/dl, and serum LDH 245 IU/L. Peripheral blood film examination showed microcytic hypochromic anemia, with anisocytosis and pencil cells. Liver function test, renal function test, and thyroid profile were within normal limits. Gastroscopy and colonoscopy were normal. Stool did not show any ovum or cyst and was negative for occult blood. A two-dimensional echocardiogram showed evidence of moderate pericardial effusion with normal heart morphology and pericardial thickness. Pericardiocentesis was done, and fluid was transudative with a protein level 1.3 g/dl, sugar 80 mg/dl, total cells were 4/cumm, all lymphocytes, ADA value was <10 U/L. No organism grew on culture; TB PCR was negative. Both patients were treated with two units of packed cell transfusion and replacement of total iron deficit by intravenous (IV) iron sucrose. Furosemide 40 mg IV was given for 2 days. Both patients were discharged on oral iron and folic acid and were re-evaluated after 4 weeks. Hemoglobin and iron studies were within normal limits. Their chest X-rays was showed normal heart size. Two-dimensional echo study showed normal heart with normal pericardium and pericardial space [Figure 2]. In the cases described, the patients had iron deficiency anemia, exertional dyspnea and edema. 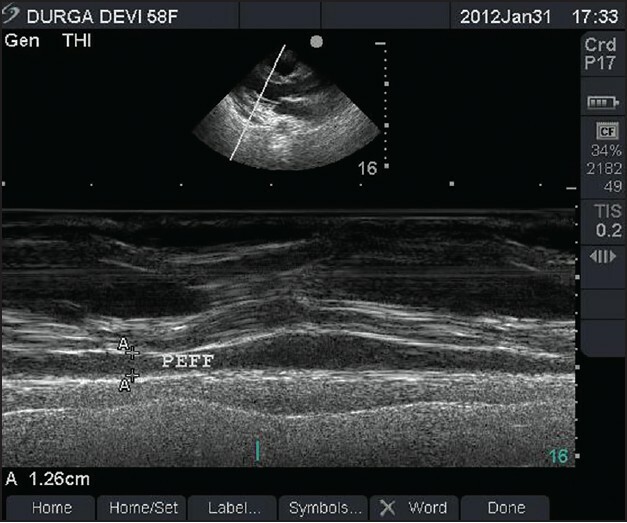 In addition, they had transudative pericardial effusion. The pericardial effusion and edema resolved with correction of anemia. 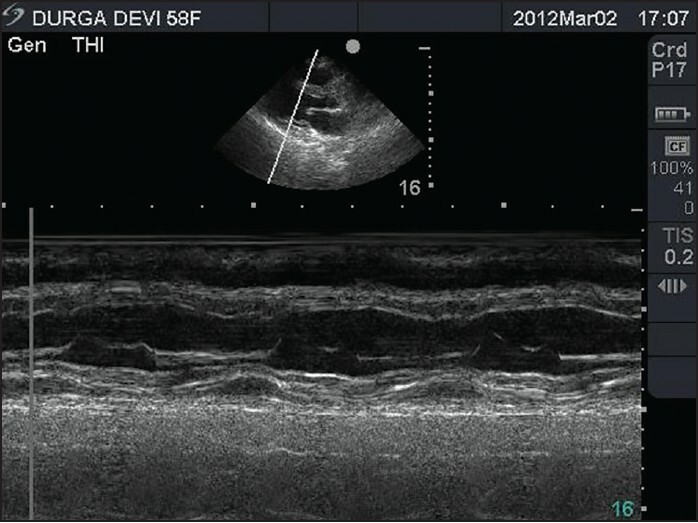 Edema due to severe anemia is a common state of occurrence, but the presence of pericardial effusion with edema has not been described until date. 1. Hoit BD. Pericardial disease. In: Fuster V, O,Rourke RA, Walsh RA, Wilson PP, editors. Hurst's the Heart. Vol. 2. New York: McGraw Hill; 2008. p. 1957. 2. Lewinter MM, Tischer MD. Pericardial disease. In: Bonow R, Mann DL, Zipes DP, Libby P, editors. Braunwald's Heart Disease. Boston: Elsevier; 2011. p. 1655. 3. Massie BM. Heart failure: Pathophysiology and diagnosis. In: Goldman L, Ausiello D, editors. Cecil Medicine. Philadelphia: Saunders; 2007. p. 346.